Ana Mardoll's Ramblings: Author Interview: R.M. ArceJaeger on "Robin: Lady of Legend"
Author Interview: R.M. ArceJaeger on "Robin: Lady of Legend"
Ana: Today we have R.M. ArceJaeger introducing their book, Robin: Lady of Legend. I haven't read this book myself, but R.M. ArceJaeger was kind enough to agree to guest blog about their book to any readers who might be interested in the subject. R.M. ArceJaeger, how would you describe your book to your prospective readers? In broad terms, what is your book about? R.M. ArceJaeger: "You are nothing but a girl, and it is high time you faced that fact." Robin of Locksley is young, headstrong, and about to receive the worst birthday present of her life. Finding herself pledged to marry a man she loathes, she runs away from home, intending to travel to London to seek help from her cousin, the King…but her journey turns deadly when she is forced to kill a man in self-defense. Hunted by both her father and the Sheriff, Robin seeks refuge as an outlaw in Sherwood Forest. Though disguised as a lad for protection, she maintains a careful isolation from the world around her...until she chances upon a young boy being beaten to death by the Sheriff's soldiers. Her rescue of the youth starts a chain of events that will catapult Robin into leadership of an outlaw band and cause her to become the most famous legend that ever lived. R.M. ArceJaeger: This novel explores the journey we all must take from adolescence to adulthood, and the need to live honorably in a society where honor is so often seen as a liability. It is about living life the best you can no matter the circumstances, and ultimately, it is about the basic rights and responsibilities of being human. R.M. ArceJaeger: When I was younger, Robin Hood was my favorite hero --- he was fast, smart, good-humored, cunning, a superb archer, and most of all, human (Superman, I love you, but little girls can't fly). I had no interest in being Maid Marian, because no matter how smart or strong a writer might make her out to be, she was always subordinate to Robin. It occurred to me as I got older that there were no myths that really empowered women. From Odysseus to King Arthur to the classical Robin Hood, women were always playing second fiddle to the guys. I wanted to change that. R.M. ArceJaeger: One book that I really loved as a child (and still love!) was Tamora Pierce's Alanna: The First Adventure. It is about a girl who wants to be a knight in a world that doesn't allow women to be one. To achieve her dream, she cuts off her hair and travels to the castle disguised as a boy. The book depicts her triumphs and struggles as she seeks to keep up with the naturally stronger lads, fight off bullies, and protect the kingdom from an evil mage. Like Robin, Alanna is clever, adventurous, strong-willed, and resourceful. She doesn't allow her gender to limit her ambitions or achievements, and neither does my Robin. R.M. ArceJaeger: This is my first published novel. I have several other books that I'm currently writing --- a few original stories, and a few that twist familiar tales in new and exciting ways. I've also received a lot of requests for a sequel to Robin: Lady of Legend, so one day I may write that as well, although I do want to finish the books I'm currently working on first. R.M. ArceJaeger: Robin: Lady of Legend is available exclusively on Amazon for $2.99. If you aren't from the US, you can get the direct link to my book by going to my website. People can also contact me through my website's Contact form, and can find links to my Facebook page and Twitter account there as well. If you want to be notified of future releases, just send me a message through my website. R.M. 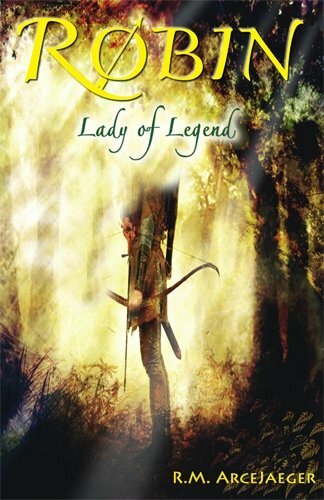 ArceJaeger: You can read the first chapter of Robin: Lady of Legend on my website. If you go to its Amazon page and click on "Look Inside," you can read from the beginning of the story to Chapter 4 for free. And RM has made a sale with this interview!